Oracle Privileged Account Manager (OPAM) is a secure password management solution designed to generate, provision, and manage access to passwords for privileged accounts like UNIX “root” or Oracle database admin accounts. It enables auditing and establishes accountability for users who normally share privileged account credentials, and has user Session Management and Recording. It leverages the Oracle Platform Security Services (OPSS) framework as a security foundation and Oracle Database as back-end data storage. While Oracle Privileged Account Manager most commonly manages shared and elevated privileged accounts, OPAM administrators can also use it to manage passwords for any type of account. For example, if the administrator of a certain group is on a leave and you have a business reason for allowing another employee to access the administrator’s system using his/her account, Oracle Privileged Account Manager can manage that privileged account. Associates privileged accounts with targets (Target is a software system that contains, uses, and relies on user, system, or application accounts) and policies with privileged accounts. Grants users and groups, access to privileged accounts and removes that access after a specified time limit. It also provides role-based access to accounts maintained in OPAM accounts. Resets passwords to a random value on check in and check out by default for security purposes. OPAM can be configured to automatically check in privileged accounts after a specified time to protect against multiple open accesses. Manages password resets on configured targets. Performs Create, Read, Update, Delete, and Search (CRUDS) operations on targets, privileged accounts, and policies. Provides an extensible plug-in framework that uses various plug-ins to perform operations such as custom notifications, usage policies, and synchronize passwords. 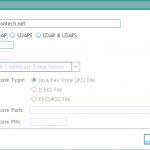 OPAM connects to targets by using Identity Connector Framework (ICF) connectors. 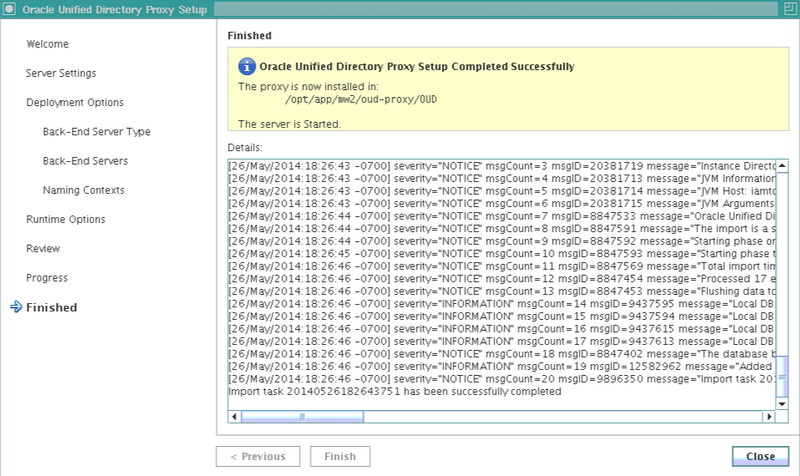 Oracle Privileged Account Manager supports database, LDAP, lockbox, and UNIX target types. 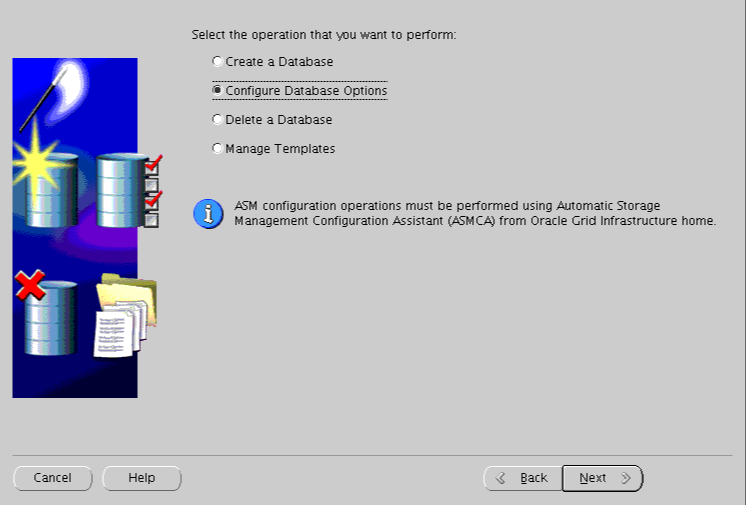 Configure Oracle Privileged Account Manager Console and servers, Manage plug-in configurations and Session Manager Configuration properties. Manage Accounts, targets (add, edit, and remove) and password usage and policies. Open and review Oracle Privileged Account Manager reports.View Oracle Privileged Account Manager Audit reports in the Oracle Identity Navigator Reports portlet. Assign end users with grants to privileged accounts, Manage Usage Policies. This group can assign Usage Policies to grants and terminate all Oracle Privileged Session Manager sessions for a selected account. 1. 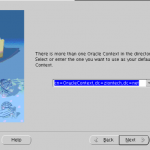 Schema Creation: Create Schema for OPAM using RCU 11.1.2.x. 2. Install JDK 1.6.29 or higher. 5. 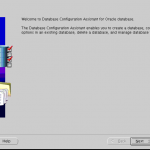 Weblogic Domain configuration: Run the Oracle Fusion Middleware Configuration Wizard to configure OPAM in a new WebLogic domain. 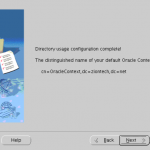 Note: During Domain creation select Oracle Privileged Account Manager template. 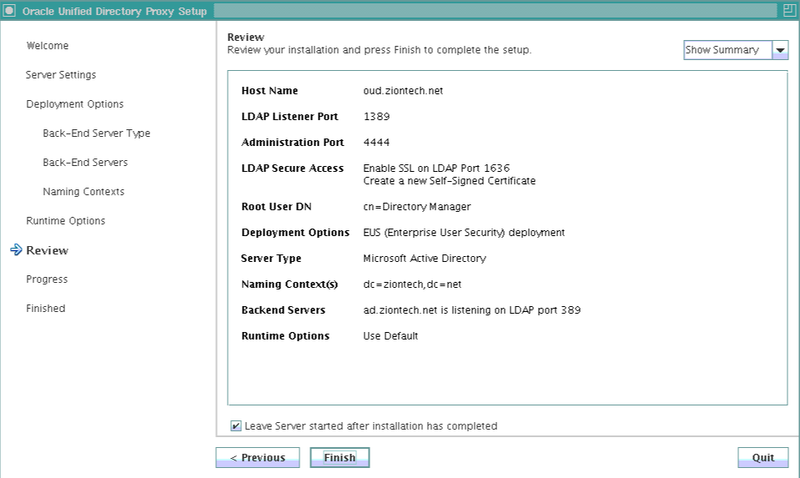 OPAM will be deployed under managed server opam_server1 running on port 18101 and 18102 (non SSL port). This will migrate policy & credential store from XML file (and files) to database under OPSS schema. Note: In 11gR1 you could keep policy store to XML, OID, or in Database. From 11gR2 onwards policy store must be migrated to Database under OPSS Schema. 1. 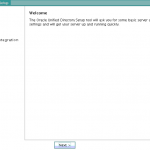 Start WebLogic Admin Server for OPAM domain. Check the status by opening a web browser and going to https://<host>:18102/opam and login via Weblogic Admin credentials. We can configure any Directory Service as an Identity store. 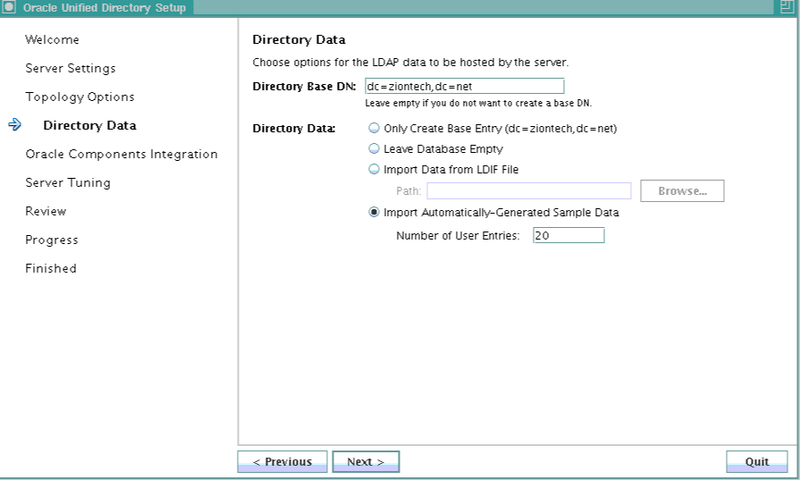 We use the embedded Weblogic LDAP Directory as the Identity store for OPAM. We do not need to create a separate Authentication Provider, instead we can use the DefaultAuthenticator. External Identity store can be used while integrating OPAM with OIM. 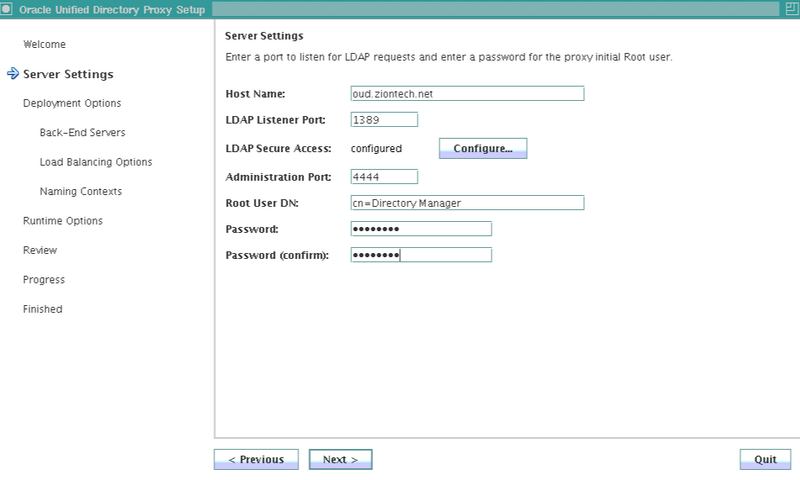 Create an Admin user in the Weblogic LDAP Directory by browsing to https://<host>:<Admin_port>/console and login using Weblogic Admin credentials. Navigate to Security Realms-> myrealm->Users and Groups->New and create “opam_admin”. Log into Oracle Identity Navigator ( https://<host>:18101/oinav ) with Weblogic Admin credentials and go to the Administrator tab. Log into OPAM console ( https://<host>:18101/oinav/opam ) with “opam_admin” credentials and confirm. Log into OIN with Weblogic Admin credentials and assign the Security Admin role to opadmin user. Log into OPAM console and check for Administrator Tab. Now we can add Targets and Accounts to be managed. 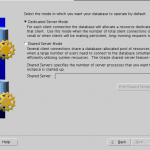 Setting up Kerberos authentication for the Oracle Databases or WNA with Access Manager is so simple if things go as per plan. To ensure smooth build process, it will be very helpful to perform some form of sanity checks wherever possible. One such check in process of Desktop SSO configuration is validating Keytab. 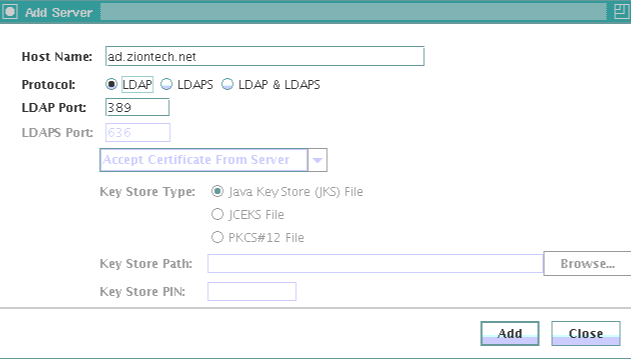 For a Keytab to successfully function the Key Version Number (KVNO) used by the Key Distribution Center (KDC) and the service principal keys stored in keytab file for services hosted on the system must match. Oracle SQLplus clients configured for Kerberos authentication fail with following message. Note that ORA-12631 is a very broad error. The KVNO can get out of synchronization when a new set of keys is created on the KDC without updating the keytab file with the new keys. Most of the enterprises use Microsoft Key Distribution Center (KDC), which is part of the Active Directory domain services. It uses the Active Directory as its account database and the Global Catalog for directing referrals to KDCs in other domains. Compare value of msDS-KeyVersionNumber with value under Ver in Keytab. They should match. If not, regenerate keytab using ktpass and replace the current keytab file. -w Specify password for Bind DN. Change servicePrincipalName value (oracle/db1.ziontech.demo in above example) according to your environment. Usually, it is same as principal (without @REALM part) found in Keytab. 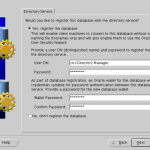 This post describes how to configure an Oracle database for Kerberos authentication with Microsoft Windows 2008 R2 Active Directory, and how to configure the Oracle clients. The final step on the Windows 2008 R2 server is to extract a key table for the database server principal. This is done using the KTPASS.EXE tool. This username must be created in uppercase and must have the realm (Active Directory domain) specified.This username must be created in uppercase and must have the realm (Active Directory domain) specified. 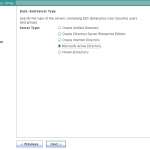 EUS can be enabled for an OUD proxy server during installation or can be configured later if a proxy instance is already existing. 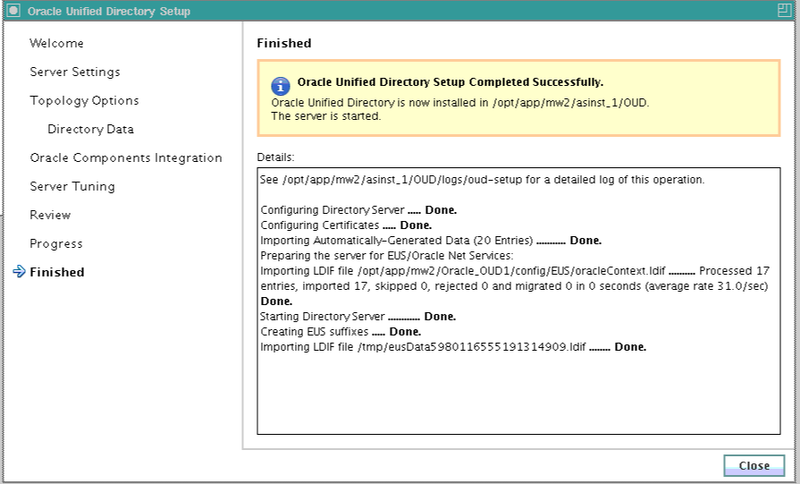 In this post, I will cover steps on how to create a new OUD proxy instance for EUS using a GUI and Active Directory as the backend. OUD base product binaries are already installed and a Web Logic domain (optionally) has been configured for ODSM. The Active Directory has user identities to which the OUD will act as proxy. An OUD proxy instance will be now created. Ensure JAVA_HOME environment variable is set to a supported JVM. 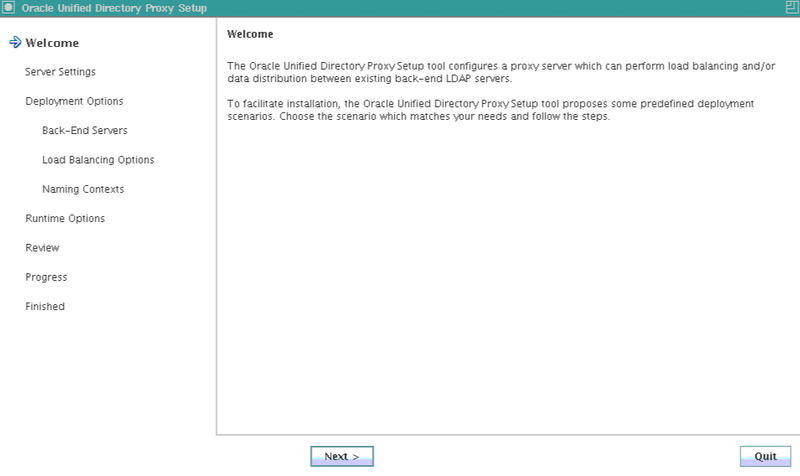 Run the oud-proxy-setup command to configure the proxy server installation. The utility launches the graphical installer. 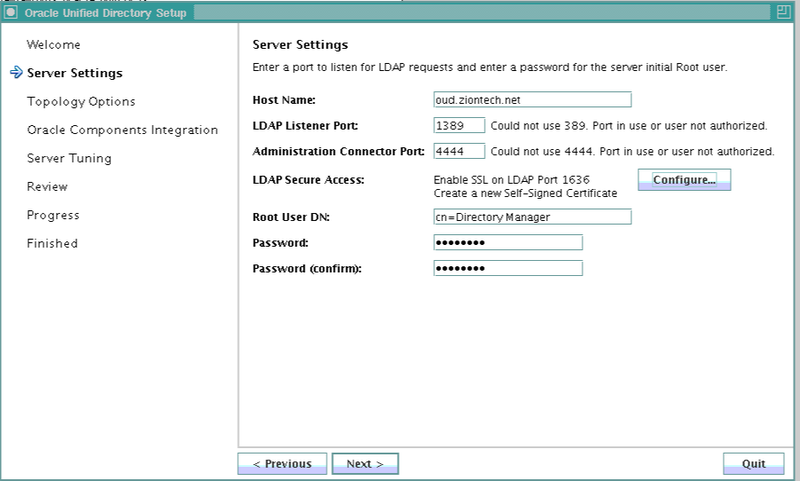 On the Server Settings panel, enter the proxy server’s host name or IP address, LDAP Port, Password for Root DN. 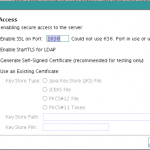 Configure the SSL Port by clicking Configure. Click Next to continue. 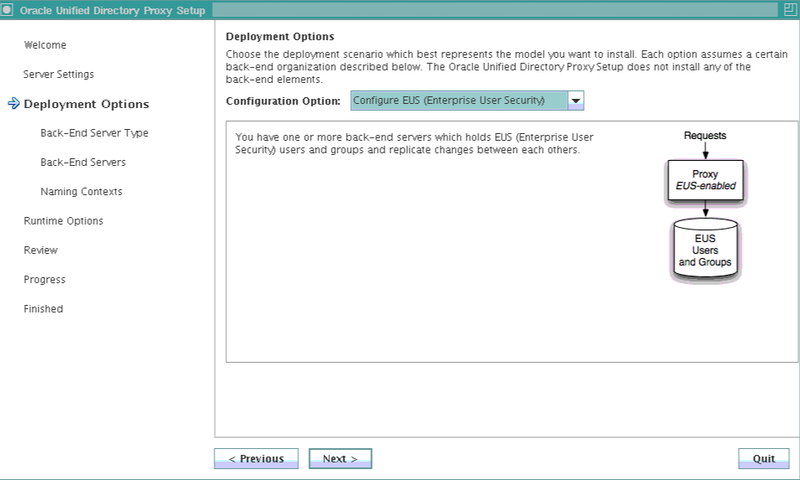 In the Deployment Options panel, select Configure EUS from the Configuration Option drop-down menu.Click Next to continue. 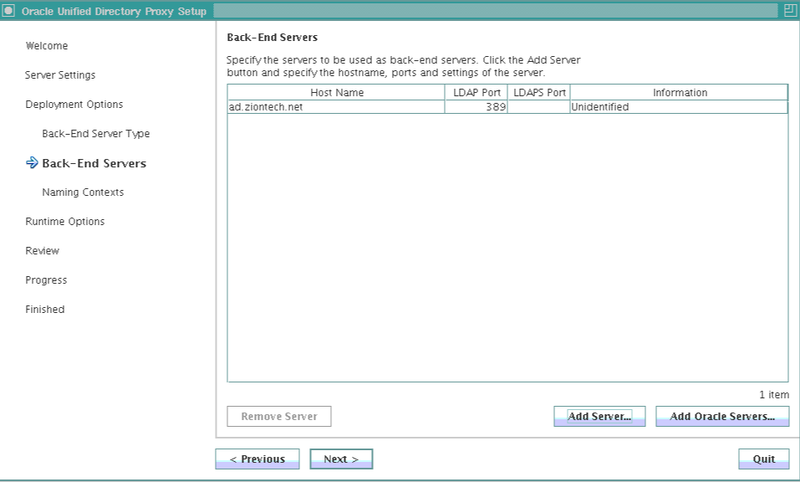 Select the backend LDAP server type. In my case, it is Active Directory. Click Next. 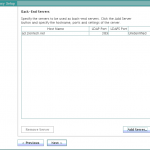 Click Add Server and provide Active Directory details. 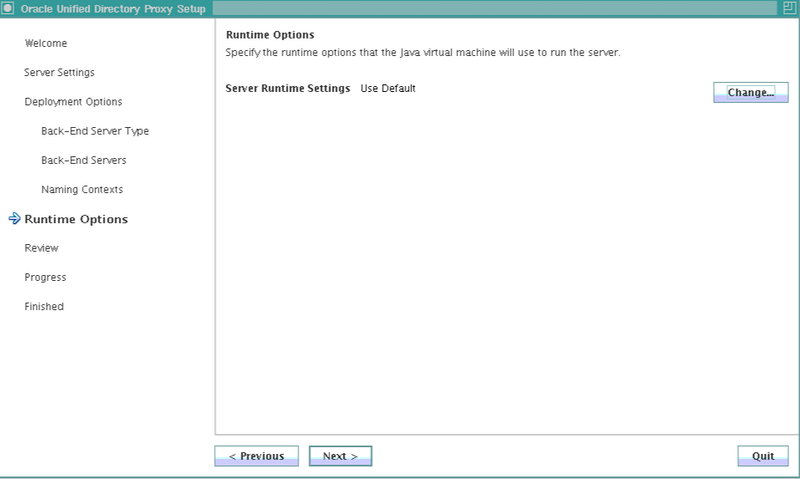 On the Runtime options panel, click Change to configure any specific JVM settings, or click Next to run the server with the default JVM settings. Once proxy instance is created, we must configure the EUS context for each EUS suffix defined. Take a backup of the eusData.ldif file located at $OUD_install_dir/config/EUS/. Create a file /tmp/password.txt which contains the password of the Root User DN of the OUD. Now edit the eusData.ldif file to replace every occurrence of dc=example and dc=com by the DN of the EUS suffix, and occurrence of cn=orcladmin by the Root User DN. 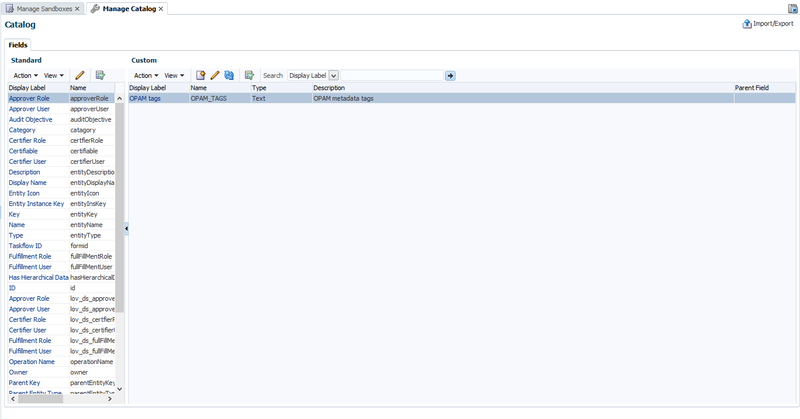 Now, login to ODSM and navigate to Data Browser. We must see user identities from an Active Directory through the OUD. This completes preparing the OUD proxy for EUS. The next steps are to prepare the database and create user mappings. After preparing the OUD and the database for EUS, users from the directory can be authenticated to the database. However, they have to be associated with a schema in the database. Directory identities are mapped to database schemas. The database schema can be dedicated or a shared schema. Directory groups are mapped to database roles. 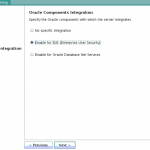 Creating a shared schema in the database enables one to map multiple enterprise users to the same schema. Run the following similar SQL statements on the database to create a user and grant basic connect access. We will then map a subtree from the OUD to this shared schema. 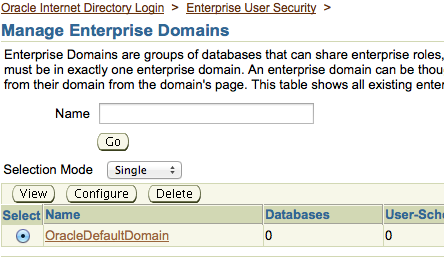 Now login to the database Enterprise Manager and select Enterprise User Security under the Server tab. 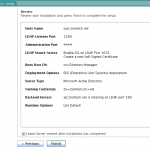 Provide directory manager credentials and login. 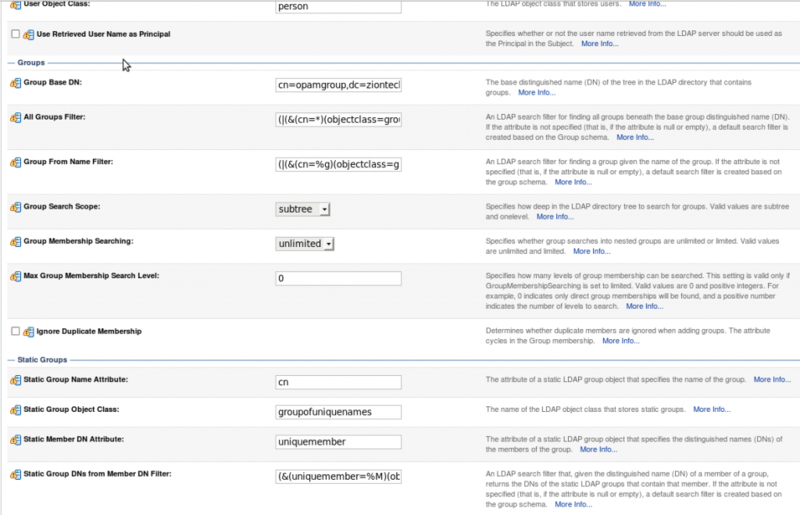 Click Manage Enterprise Domains, click Configure, and go to the User Schema Mappings tab. 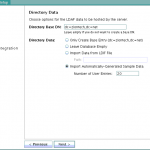 Select Subtree and click on torch icon to select all users to map to this shared schema. Click Continue. Now try to login to the database with OUD user credentials. To map a directory user directly to a database schema, the first step is to get the complete DN of this particular user from the OUD. Now, on the database run the following statements to create a user called ldap_nasir locally in the database. This will be authenticated using OID credentials. We can also alter an existing user in the database so that the user will now use OUD credentials to login. Similarly, we can map database groups and roles under the enterprise roles table and proxy permission. We will now create a global role in the database that allows access to the hr.employees table. The following SQL statements create a global role, hr_access, and grant the necessary privilege to it. Next, we create an enterprise role called hr_access and assign the global role to it. We then assign this enterprise role to the enterprise user, nasir. 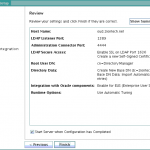 The enterprise role can be created using Enterprise Manager. Click the Server tab. Under the Security section, click Enterprise User Security. 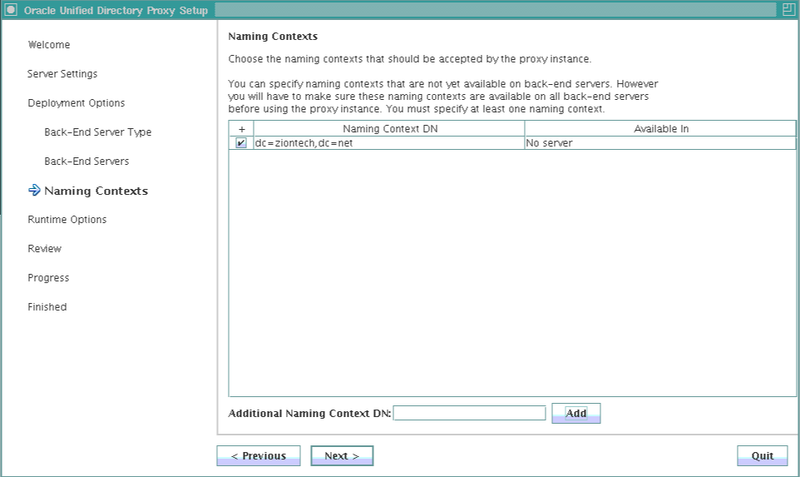 Enter the distinguished name (DN) of a directory user who can administer enterprise users in the User field. Enter the user password in the Password field. Click Login. The Enterprise User Security page appears. 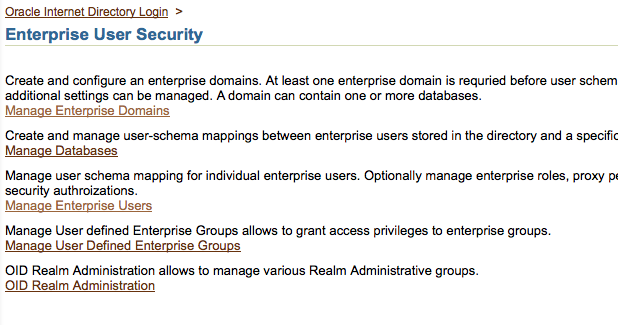 The Manage Enterprise Domains page appears. 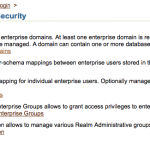 This page lists the enterprise domains in the identity management realm. 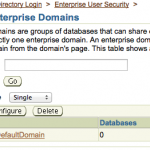 Select the enterprise domain that contains the database. Click Configure. The Configure Domain page appears. Click the Enterprise Roles tab. The Create Enterprise Role page appears. Enter hr_access in the Name field. 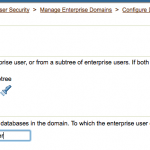 Click Add to add the database global role to the enterprise role. The Search and Select Database Global Roles window is displayed. Select the hr_access global role in your database. Click Select. Note: You will be required to log in to the database before you can select the global role. Click the Grantees tab. Click Add. Then Select Users or Groups window appears. Select user Nasir. Click Select. 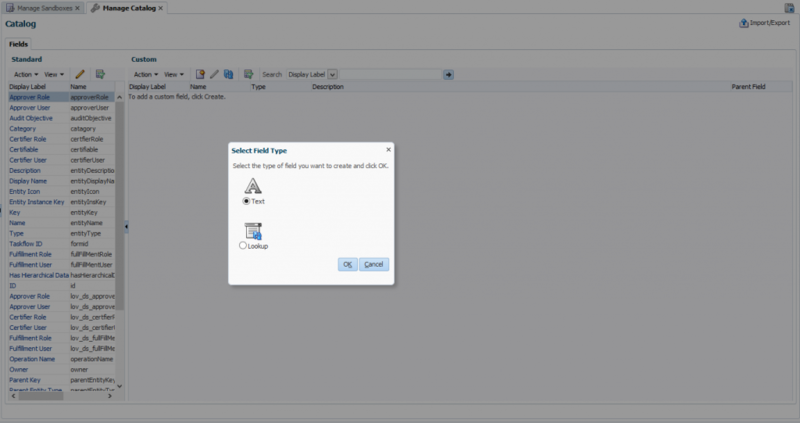 Click Continue in the Create Enterprise Role page. Click OK in the Configure Domain page. The enterprise user, Nasir, can now access the hr.employees table in the database. 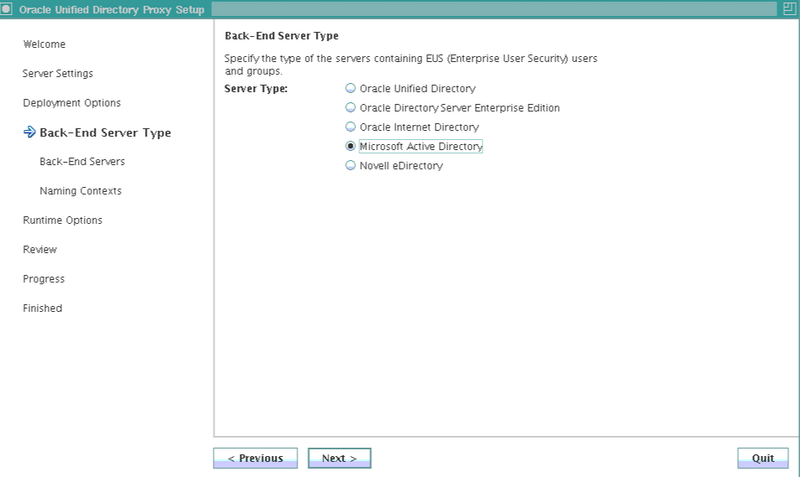 After preparing Oracle Unified Directory (OUD), the database itself must be prepared for Enterprise User Security (EUS). Preparing a database involves configuring the database, registering the database, mapping the user(s) or group(s) to a schema. Similar to OUD, there is more than one way to achieve this. We will use GUI. 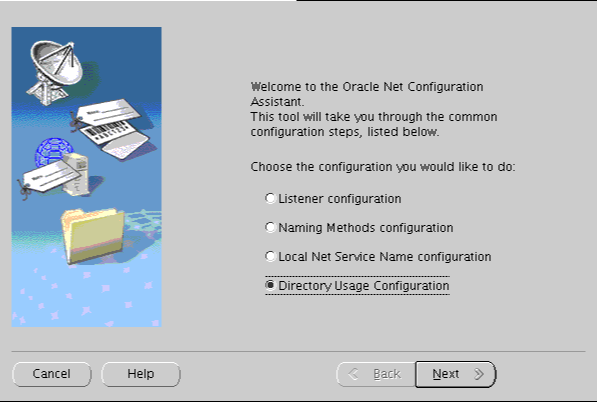 Run Net Configuration Assistant (netca) tool to configure OUD for the database. 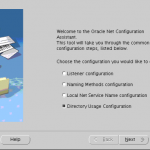 Select Directory Service Usage Configuration and click Next. 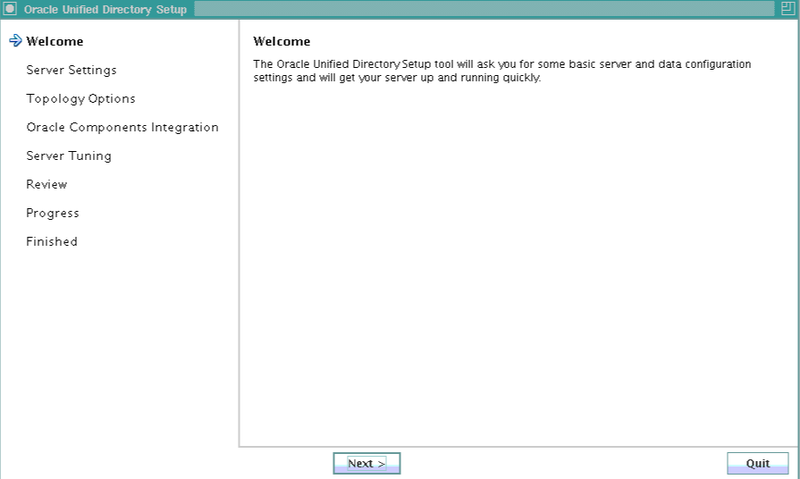 Directory Usage Configuration, Directory Type screen is displayed. 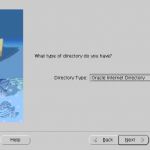 Select Oracle Internet Directory as the directory type and click Next. 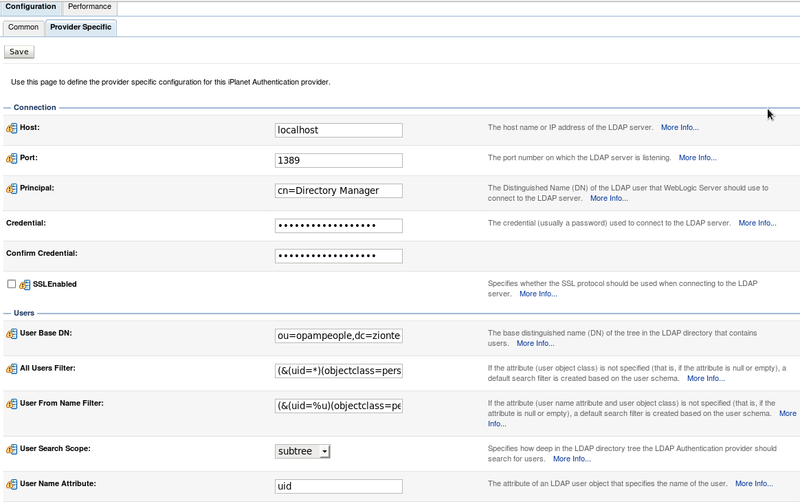 On next screen, Enter the name of the host on which the OUD server is running, its port, SSL port and click Next. 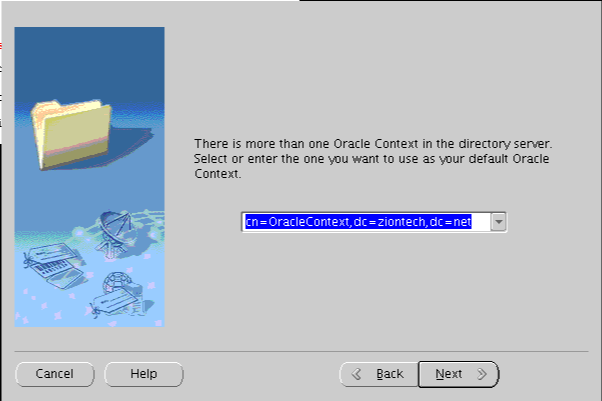 Select the default Oracle Context to use. 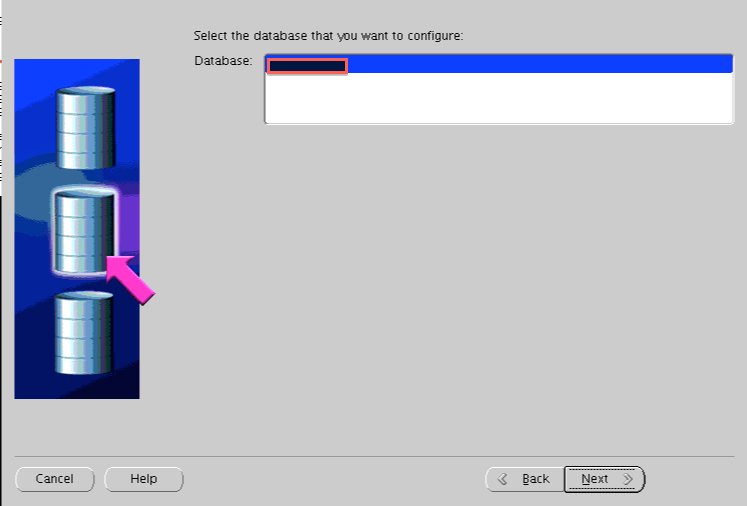 Select the one that includes your base dn or you will receive TNS error while running dbca. 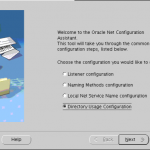 NetCA creates an ldap.ora file in the $ORACLE_HOME/network/admin directory which stores the connection information details about the directory. The Database Configuration Assistant (DBCA) tool enables to register the database with OUD. 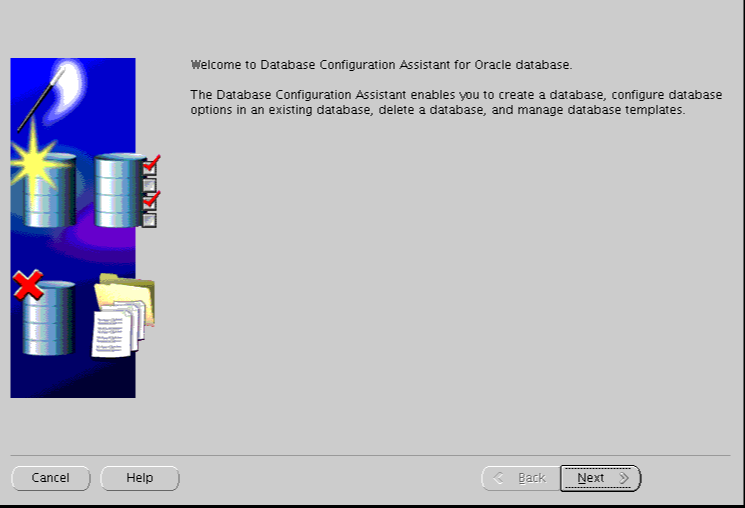 To register the database with the directory: Start DBCA using the dbca command. 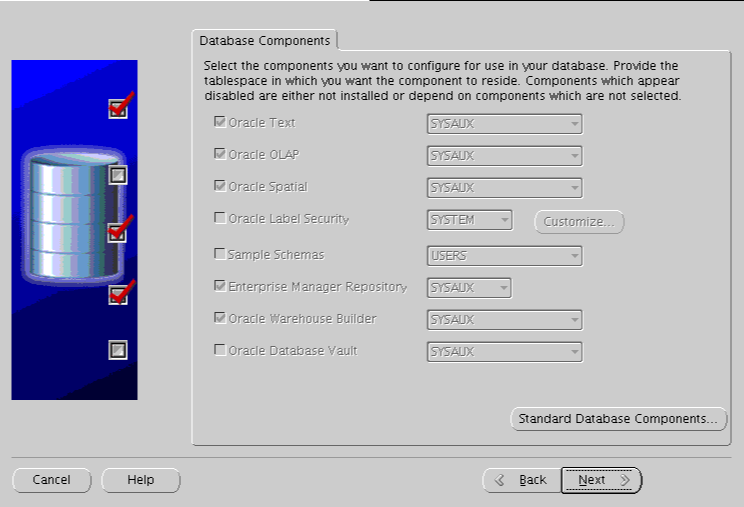 Select the database to which EUS will be configured. Select Yes; register the database. Provide credentials for OUD and a password for wallet. 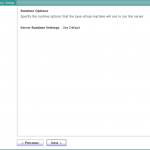 Select Dedicated server mode and Click Finish. Once the database is prepared, we need to associate enterprise users to database. Please refer to this post to learn about various user/group mappings available. 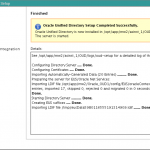 This post outlines steps for enabling EUS during instance creation. OUD base product binaries are already installed. 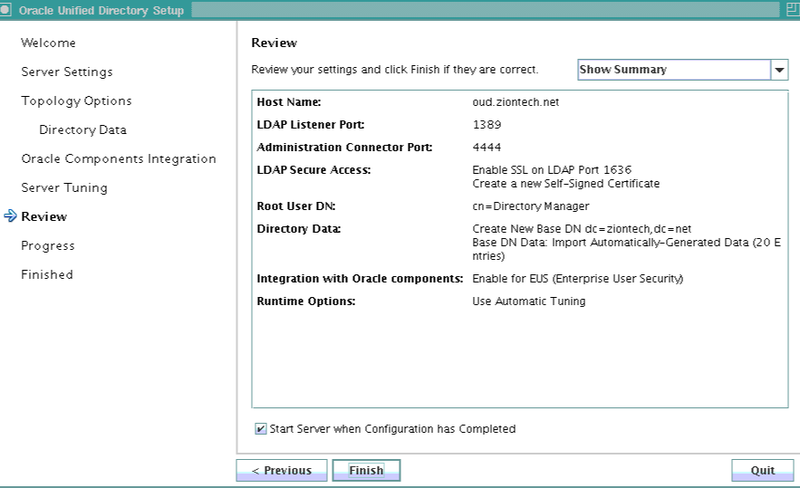 A WebLogic domain is created for ODSM. An instance has yet to be created or a new instance will be created for EUS. Ensure that your JAVA_HOME environment variable is set. 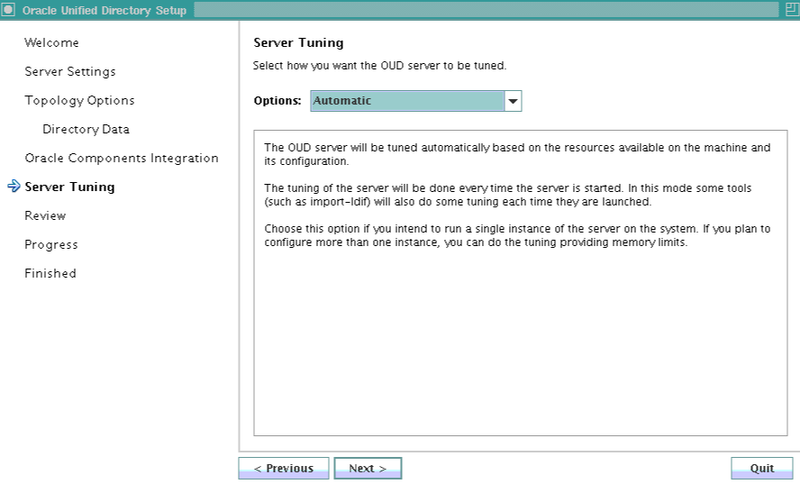 Run OUD-setup; this will create an OUD instance. Click Next on first screen. Provide details for the server settings. Since enabling EUS requires an SSL, configure an SSL. 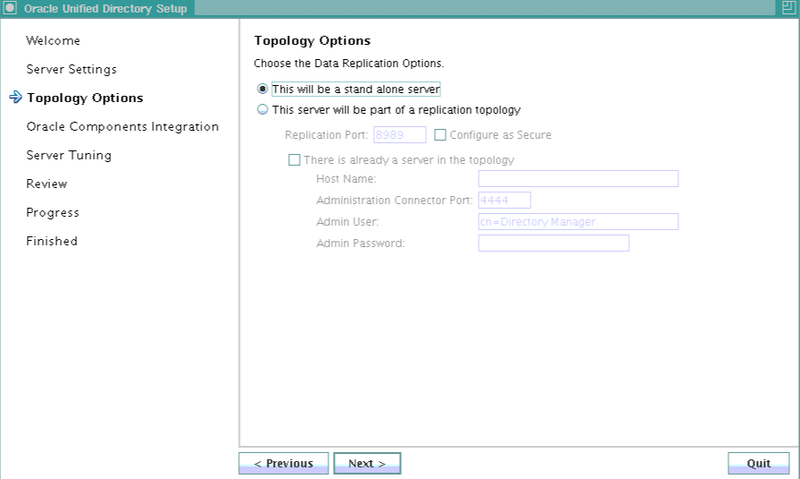 Select your topology, if required. Provide the base DN details. 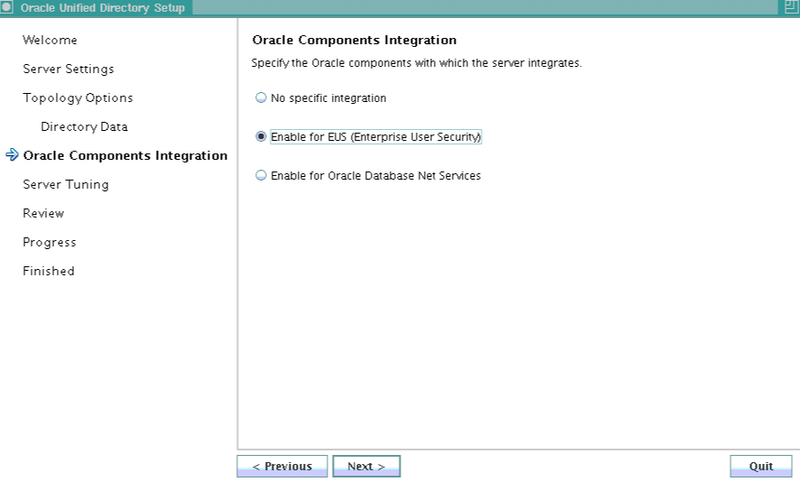 Select Enable EUS on Oracle Components Integration screen; click Next. Review your configuration details; click Finish. 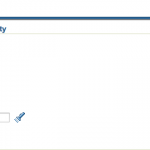 Create a connection for the newly created OUD instance and login. An EUS workflow element is also added in front of the local backend workflow element. A DN renaming workflow element for “cn=schema” is added, so that it can be accessed using the “cn=subschemasubentry” DN. Replace dc=example,dc=com with the correct naming context for your server instance. Replace ou=people and ou=groups with the correct location of the user and group entries in your DIT. With this, we have an OUD instance ready for EUS. The next steps are to prepare the database and create user mappings.